I turned 38 and was finally able to equip all my beautiful 38 critted gear, the armor made by me and jewelry from a kinmate. Unfortunately it was only beautiful in terms of raised stats and a thrill of accomplishment, not in an aesthetic sense. Time to design a new outfit for my darling bulldozer! 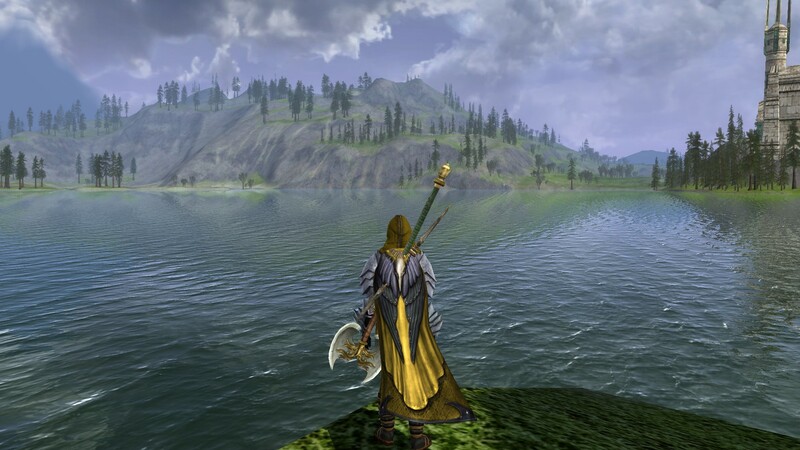 After all my wandering around Evendim, I was craving a little yellow to offset all the lush greens and blues of that gorgeous zone. When I’m designing outfits for my guardian, I always want her to look like a guardian. All that lovely leather armor is great, but doesn’t make sense for her to quest in. The other thing I try and take into consideration is her level. I want her to look nice, yes, but also to look level appropriate so that it stays visually fun to reach a new level range. I knew I wanted to use that chest piece, and luckily it’s one of the few items that dyes a decent yellow instead of bright chartreuse. I liked the crafted shoulders and gloves, but couldn’t get them to match as dyeing the shoulders results in very murky colors, and it’s naturally much darker than the undyeable metal on the gloves (on the gloves it’s the leather part that you can dye, but they turn out very dark compared to everything else). And then, eureka! If I dyed the shoulders white, the metal became the same color as the gloves! Perfect. 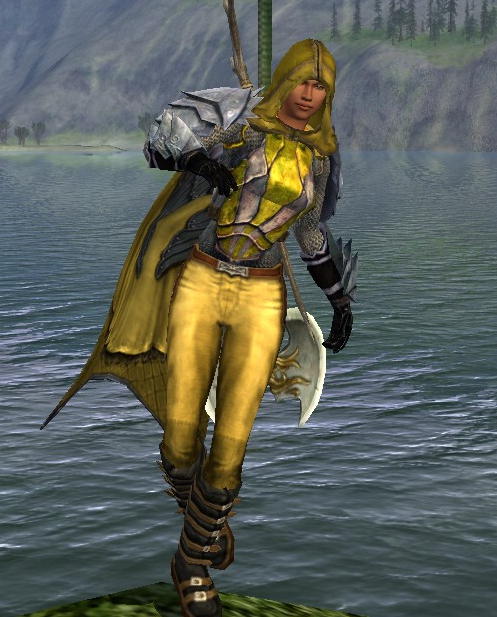 All I needed were pants that could match the yellow of the chest piece, and these ones dyed gold came the closest. I’ve always thought these shoulders looked a little like wings, so pairing them with the cloak of the raven was a natural choice. I couldn’t get a helm to go with everything else and was tired of using the circlet of men, so the traveller’s hood officially became my first store purchased cosmetic item. I think it finishes the look nicely. I am still looking for better pants, I would like to find a pair that dyes a little closer to the rest of the outfit, and where the belt is black not brown, and I’m still searching for better boots for this outfit. Again, I don’t think the brown goes, but all-black boots didn’t work either. Ideally I’d like to find a pair that has metal shin-guards that echo the design of the shoulders and gloves. Black and gold boots may work as well.